﻿ The Circus › Circus Forums › CLOWN › Clown Hall › READ ME FIRST: Welcome to The Circus! Circus Forums › CLOWN › Clown Hall › READ ME FIRST: Welcome to The Circus! Post subject: READ ME FIRST: Welcome to The Circus! We bring you the clowns"
Hello and welcome to The Circus. This post provides some general information about our website, and is updated irregularly. 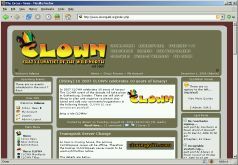 For some general information about our gaming society, check out the Enclownopedia forum and the CLOWN Manifesto. I like you guys. Can I join? Sure. Post a post in our Applications forum, following the procedure in this post. We look forward to hearing from you. There are several forums on this website, at least one per game we play, plus a few general and information forums. Please try to post posts in the most relevant forum. The most active games have their own categories and may contain specialist forums for things like raids, private council discussion and game-specific applications. The CLOWN gaming society has played many games in the past and these active games will often change. Most forums are hidden from anonymous and registered users that haven't been added to the correct usergroups. Please contact an administrator if you can only see one or two forums and think you should be allowed to see more! I can't post in any forums, and there are only three of them! In order to see all of The Circus forums, you need to be registered as a Student of CLOWN, a Full CLOWN or (if you are not in any CLOWN game guild but play/have played with CLOWNs) a Friend of CLOWN. Contact an Administrator to be added to one of these groups. You can use the automatic sign-up feature to request access to a group by going to the group page for Students of CLOWN or Friends of CLOWN, but an administrator will still need to approve your request. Adenas should be contacted in the event of any technical problems with the website. If he is unavailable please contact Slinver. Circus Wardens (Moderators) moderate the forums for bad behaviour and can post sticky posts and announcements. Their decisions are final, but we're a happy bunch here and rarely moderate anything. A list of Circus Wardens can be found here. Anonymous posting is NOT allowed on any forums except for the applications forum. This is to reduce bots posting spam and advertisements on our forums. We recommend that regular visitors sign up and use accounts wherever possible. Registration is free, quick, and you don't have to be a CLOWN or a Student of CLOWN to do it. 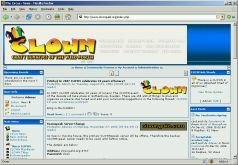 Full CLOWNs are given access to game-specific restricted forums. Send a PM to a Circus Administrator if you're a full CLOWN and don't have access yet. 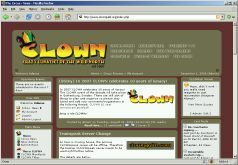 Students of CLOWN are given access to game-specific restricted forums. Send a PM to a Circus Administrator if you're a Student of CLOWN and don't have access yet. Friends of CLOWN are people who we play with regularly in CLOWN games but who are not members of CLOWN, who might need to have a say in our internal discussions for various reasons. They are given access to game-specific restricted forums and most hidden forums on this site. Send a PM to a Circus Administrator if you're a CLOWN or a Student and want to nominate someone to be added to the Friends of CLOWN list. Council Members, officers, raidleaders, classleaders and the like for each game are given access to private forums which are restricted to officers for that game. The exact forum structure used depends on the game. Send a PM to a Circus Administrator if you're a council member for any CLOWN game and don't have access yet. Spirits of CLOWN are given access to all private Council forums and to a special forum for Spirits of CLOWN only. Send a PM to a Circus Administrator if you're a Spirit of CLOWN and don't have access yet. The CLOWNing Committee is an unofficial committee who organise CLOWNings and have their own private forum for this purpose. If you want to help organise a CLOWNing in a game you should send a PM to a Circus Administrator requesting access. This is a private website intended for CLOWN guild members, and we do not welcome advertisers. If you are found advertising or spamming our forums your account will be suspended. Please use The Official Suggestions Thread for making suggestions. Any registered user can post pics in our Circus Pictures section. Please select the correct category when uploading pictures and photos. The pics work so we don't need a petition. However if you feel you must sign something, you could try this thread. Here in CLOWN we like to keep things civil. Bad behaviour will not be tolerated, and please refrain from using profanity. You can post links to content which might be considered offensive by some people, but please put a warning in the title of the post if it is not suitable for work (NSFW) or might be considered to be a bit risque. We reserve the right to modify or delete posts as we see fit if they are not considered by our moderators and administrators to be appropriate. 1. Always say what you change. If you delete a post, or modify someone's post, always post saying what you've done. 2. Swearing is OK. Editing out all swearing is pointless and time-consuming. Only gratuitous swearing should concern us. 3. If someone's being a troll, best leave them to it. They will seem like an idiot all by themselves and deleting posts may be seen as censorship by other forum users. Lock posts if they get too heated, but always remember rule 1. 4. Don't sticky too much. Not all announcements have to be sticky. Think carefully before posting anything. 5. Always think before you act. Take time to consider posts that may require moderation. Are you thinking objectively, or are your emotions clouding your judgement? 6. Always warn before you act. Tell people if they're out of line, don't just delete or modify their posts. 7. Spam bots are evil. If you see spam or advertising, it's OK to delete it straight away without telling anyone. 8. Remember the pie. Remember, we're a close community here so deal with others with respect. Registered users can have their own avatars. To set an avatar use the My Avatar page. You can select from several hundred avatars we have uploaded, link to an avatar on a different website or upload your own avatar using this page. Please keep all avatars work-safe. Offensive avatars will be removed and you may be banned from having an avatar if you continue to flout the rules. Maximum avatar size is 120x120 pixels and 14KB, although this can be raised in special circumstances. Registered users can have their own signatures, which appear on every post that you post. To set a signature use the My profile information page. Many people post the names/levels of their characters in various games in their signatures. Images are also allowed in signatures, but please make sure that they are not too big. Please refrain from posting offensive signatures. Offensive signatures will be removed and you may be banned from having a signature if you continue to flout the rules. Registered users all have profiles which contain information about them. To set your profile use the My profile information page. This contains fields which can be filled in describing where you're from, your contact details, interests and other information. Please make sure that these fields are up to date. Please also consider posting an introductory post about yourself in the Introduce Yourself Forum. Some examples are given in this forum, and it is an excellent way for people to get to know each other. I want to change my username. Can I? Sure. Just PM an administrator and they can do that for you. BBCode is used on this forum. For more information on BBCode, see this page. A quiet clown (0 posts). A curious clown (1-10 posts). Not too shy to talk (10-20 posts). Just can't stay away (20-40 posts). Quite a regular (40-80 posts). A bit obsessed (80-160 posts). A true loony (160+ posts). CLOWN (available to full clowns). There are a few "themes" to choose from when loading the Circus website. Themes can be changed by registered users on the Preference Page. CLOWN_Mini: As CLOWN_Lite, just without the CLOWN logo at the top of the page. default: This theme isn't officially supported, but needs to be installed for certain functions of the site to work properly. Feel free to use it if you want. The old website is still all there and online, just hidden (very badly). To access your old posts and private messages etc go to http://old.clownguild.org (or alternatively http://www.clownguild.com/mpn). Please do not post anything further on the old site however.